Easterseals provides opportunities for people of all ages with a range of abilities to achieve their full potential. Together, we’re changing the way the world defines and views disability. Early learning program nationally recognized for high quality, family-centered education for children ages birth to 5 years. Easterseals collaborates with 40+ early childhood programs located in the city of Chicago and suburban Cook County to promote school readiness in young children of all abilities from families with incomes below poverty guidelines. Builds the capacity of school districts statewide so they may provide effective programming for students with an autism spectrum disorder. Our individualized coaching, consulting, family engagement and training programs offer school districts a wide-range of options. 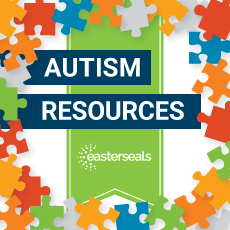 Is a program providing evidence-based information and resources for autism spectrum disorder. The outreach program is for individuals living with an autism spectrum disorder and the families, caregivers and professionals who support them. Located in Rockford. HarrysButtons.com at Easterseals improves the lives and futures of individuals living with autism spectrum disorder and other disabilities by providing employment opportunities. Locations in Chicago, Machesney Park and Tinley Park. Search for other Easterseals providers near you. Click here to view or download our programs and services booklet.